A product's Etsy Properties page lets you add all of the attributes and inventory for its listing on Etsy, or update the existing ones. To access this page, go to Product Summary page > Toolbox > Etsy. 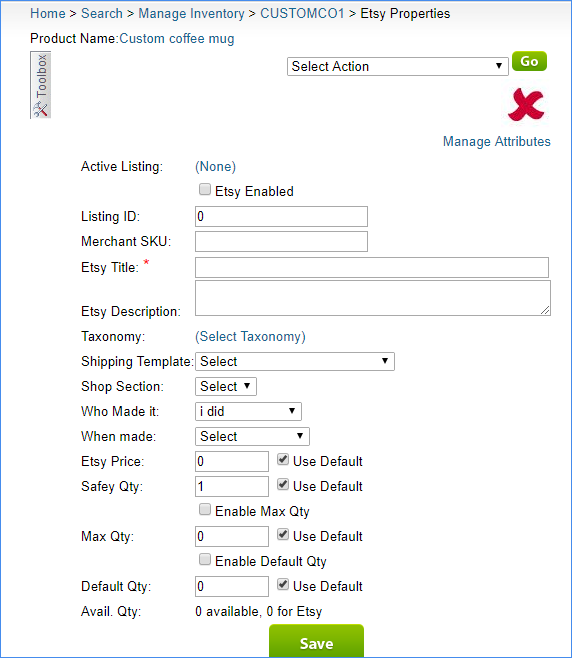 Auto-populated as a unique listing ID from the report sent by Etsy after the product is listed. Select to automatically send inventory updates. If this is not selected, the product is still included in the updates, but with a quantity of zero. * Required for the product to be listing-ready. Auto-populated after the product is officially listed. SKU that is sent to the channel for orders, inventory updates, etc. If this is left blank, product ID is used instead. Title of the product that will appear on Etsy. *Required for the product to be listing-ready. Description of the product that will appear on Etsy. Click Select Taxonomy to choose from a list of pre-defined categories. Note: Taxonomy is a prerequisite to choosing the product's attributes (click Manage Attributes). Choose an Etsy shipping template. If you are using Etsy Shop Sections to organize your items, choose one from the dropdown list. Shop sections must first be downloaded in the Etsy General Settings to appear here. SHOW ME. Choose "i did" or "someone else." Choose from a list of general dates or made-to-order. Enter the price of the product listed on Etsy. Alternatively, choose Use Default to pull Etsy Price from the Site Price on the Product Summary page. Enter a quantity to subtract from the Avail Qty to help prevent overselling. Alternatively, choose Use Default to pull Safety Qty from the company-wide Etsy settings (Settings > Company > Toolbox > Etsy General Settings). Use Default will override the value in the Safety Qty field. *Required if using Max Qty. Enter a maximum quantity to send to the channel. If used, Enable Max Qty must also be selected. Alternatively, select Use Default to pull Max Qty from the company-wide Etsy settings (Settings > Company > Toolbox > Etsy General Settings). Use Default will override the value in the Max Qty field. *Required if using Default Qty for replenishable products. Enter a default quantity for this product on Etsy. If used, Enable Default Qty must also be selected. Alternatively, select Use Default to pull Default Qty from the company-wide Etsy settings (Settings > Company > Toolbox > Etsy General Settings). Use Default will override any value entered in the Default Qty field. The first number will show the total quantity available, and the second number will show the total quantity available for Etsy. 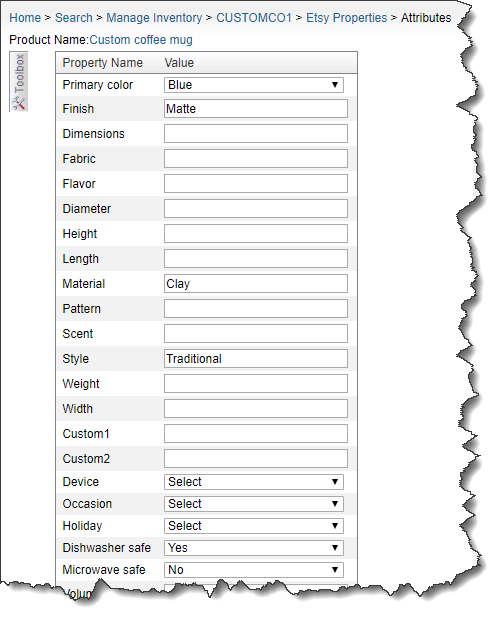 Choose from a list of properties that provide more information in the product listing. SHOW ME. Note: A product's Taxonomy is a prerequisite to its choosing attributes. If a product lacks the required Etsy values and attributes, this error appears before you can complete certain actions. Hover over it to see the missing properties, as shown in this sample error message. Post/Update Product to Etsy - Post the product and create the listing. SellerCloud pulls a unique listing ID into the Active Listing field. Update Price and Qty to Etsy - Update the product's current price and available quantities on its Etsy listing. Update Product Attributes to Etsy - Update the product's current attributes on its Etsy listing. Variations of products can be posted to Etsy from SellerCloud. Currently, variations with up to two dimensions are supported. To post the n-matrix to the channel, simply post the parent.